It seems like everything requires so much of my attention lately that I haven’t had time to sit back and smell the Christmas tree. I figure you’re likely going through much of the same, and I hope to throw a few easy to prepare meals on here over the next couple weeks. The prep work on these enchiladas is simple and can be thrown together in just a few minutes. They’re healthy and tasty, and even better the next day. 1. Preheat the oven to 400 degrees and get out a 9x13 inch Pyrex baking dish. 2. In a colander, squeeze out as much water from the spinach as you can by pressing the spinach with the back of a spoon. Place the spinach in a large bowl. Add the rinsed beans, drained tomatoes, most of the scallions, and dash of garlic powder, onion powder, salt and pepper to taste. Set aside. 3. Mix together the sour cream and green chile enchilada sauce. Spread about 1/3 of the sauce mixture into the 9x13 inch dish. 4. On a plate, place a tortilla and top with some of the spinach mixture and a small amount of pepper jack cheese. Roll into cigar shape and place into the baking dish seam side down. Repeat until the dish is full. 5. Spread the rest of the sauce on top of the enchiladas and top with the remaining cheese and scallions. Bake for about 30 minutes or until hot and bubbly. Wait a few minutes and serve. Can you hear my stomach grumbling? I would LOVE these!!! Will file away for a special day. Black beans are soooo good in everything!!!! Loved these!!! You should publish a cookbook! I love the kind of thing that gets better the next day. And healthy enchiladas with black beans. YUM! What a delicious change from all that holiday baking out there! YUMM-O! Perfect! I love enchiladas and would eat them every day if I had my way! 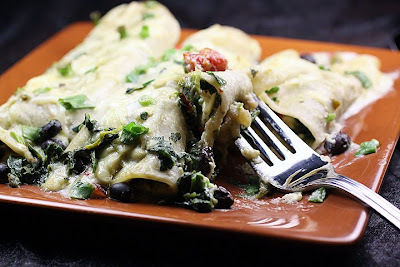 These enchiladas look fresh, healthy and delicious, A perfect weeknight meal. Thanks for sharing. Will stop at the store to get a few ingredients, then I plan to make these later in the week. Can't wait!! Mmmmmm, a new enchilada variation:) Just reading the ingredients sounds delicious! And the photo-YUM:) I think I have most of the ingredients on hand and I know my husband will love these! Thanks for sharing a fabulous recipe, Laura! Yum! Finally an enchilada recipe that doesn't look so intimidating. I love that it's vegetarian too. Thanks, Laura! I'm a big fan of greens in enchiladas (or served alongside). Do you have a favorite brand of canned/jarred green enchilada sauce? I don't have a favorite brand because we can only get one kind here. Sad huh lol. Ooh...looks so good! And easy! I adore enchiladas, especially ones with lots of cheese. Mmmm these look so yummy! I love enchiladas. Thank-you Shar! I am so glad you liked this one. I made this tonight and it was delicious!! I had extra filling (that always seems to happen to me with enchiladas) so I mixed it with some quinoa and...ta-da! quinoa salad!! My husband made these and they were wonderful! So spicy and delicious! The only problem was I ate too much :). I'm happy you liked this! Thank-you for letting me know. These are the most amazing enchiladas ever! Everyone raved about them! Thanks for the recipe! I MUST try these asap!